Which is the very first file viewer or editor you go for after a fresh install? MS Office…WinRAR…Adobe Acrobat…a NFO Reader The 3 Best NFO File Readers To Open Those NFO Documents The 3 Best NFO File Readers To Open Those NFO Documents Read More , or any other? For me it’s my web connection because I know that if there’s an emergency, Google Docs Viewer can handle it for me. 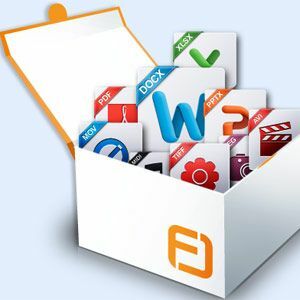 Some asked our wider community the same question – What is the best universal file viewer? A few worthies were mentioned. I found Universal Viewer to be a bit limiting especially when it comes to media files and even PDF. That made me turn to the one ‘criticized’ in the query itself – Free Opener. The road to install the free file opener and viewer is a slightly long one. You have to download an installer first – InstallIQ. Free Opener makes it clear that it is supported by other third-party programs that enable it to survive as a free application. Opening Internet Explorer to display an ad for such a program is slightly irritating. Close it and get on with the installation. Don’t blitzkrieg through the steps because you might inadvertently install something like the Ask Toolbar. Hit one of the two options at the bottom (Decline Optional Software) and forge ahead. I liked the fact that Free Opener does not forcefully install a menu group under the right-click menu. You would appreciate a “Select All” or “Select None” option here to have more control over the file associations. But that’s missing in action so far and you have to manually go through the 80+ file types. Yes, as we said before – 80+. Free Opener can help you view the following file types: code files, web pages, Photoshop files, images, XML files, PowerPoint presentations, media files, Microsoft Word documents, subtitle files, icons, torrent, Flash animation, archives, Apple pages, CSV files, vCard files, EML documents, and PDF. Here is the massive list of file types. For all the noise and the build-up, Free Opener is simple in the way it handles so many file formats. Browse to the file you want to open. Click on the file to select it and then click Open. If the file is supported it will open in Free Opener. The real action happens when you open each specific format. All the required controls to manage that particular document are on display with the document. Here’s for example, a Microsoft Word document opened with Free Opener. You can see all the basic formatting options in the toolbar below the document. Free Opener cannot open multiple documents at one go. But you can open multiple instances of it if you need to open multiple documents in different formats. The memory footprint for a single instance is approximately equal to that of today’s current browsers with a few tabs open, so it’s not something that your computer cannot handle. But yes, it is not lightweight either. Here’s what an image file looks like in Free Opener. As you can see from the screenshot below, it comes with a few basic picture controls which you can calibrate with sliders. There’s the Crop and Resize option too. The media player can handle avi, flv, mid, mkv, mp3, mp4, mpeg, mpg, mov, wav, wmv, 3gp, and flac thanks to the K-Lite Codec pack it downloads during the install. The media player is basic, but has some nice touches with video smoothening, audio-video sync, and Direct X video acceleration. Then, you can play your videos in full-screen too. The Print option is visible for supported file types. Free Opener says – Unfortunately, we do not currently support printing from all file extensions. We hope to support all file extensions in the future. Try out Free Opener. Is there any file format which you routinely use that it does not include? I noticed that it cannot open DWG (AutoCAD files). But then, that’s a specialized file type. Do you have any other universal file opener or viewer to recommend? We are listening. I've been using DITTO forever! Saves a ton of time. Looks cool :) Thinking of download this. I think, I'll give this one a try but for the most part I like my things to be seperated in diffirent applications rather than use this kind of application, but great job for creating it. It really is inovative. This would be awesome if it will have a portable version, you know, just for emergency situations. I use free viewer for the same work. This looks interesting, but I don't encounter a ridiculous amount of file types, and for those that I do encounter I usually have dedicated programs that I like to use. Could this also be installed to a flashdrive? Because that would make this astronomically useful. You can search for extensions and it will give a short list of programs that can open that extension for windows/osx/linux. It's only failed me a few times for some proprietary extensions that I didn't recognize. Of course, if you don't handle too many files, why should you use it. But it pays to know about an option, right? Pity, it does not have a portable version. It would have been very useful. What's good about Free Opener, I found it will open some corrupt Word DOCX files which Word 2007-2013 choke on. WordPad does also but I think Free Opener, along with another similar program called Free Editor, http://www.freeeditor.com/, which I think was also reviewed in MakeUseOf, will open more. The swiss army knive of applications? Pretty cool! awesome application i am going to download it right now .